Just to lay the groundwork - I’ve known about the hotel since first attending the D23 Expo in 2011, and always dreamed of staying there for a future expo. Because of the nature of my career, I’ve never been able to plan my travels far enough in advance to secure a room at the Hilton Anaheim for the past D23 Expos. That’ll change in 2019 for the next one, but I’ll get to that later. Driving up to the massive hotel you'll notice that Disneyland, California Adventure, restaurants, and convenience stores are just a couple of steps away. And just incase you don't feel like traveling too far, options like Starbucks, Sbarro, Baja Fresh Express, and even a full service bar and restaurant are waiting for you downstairs. Let me emphasize that they have a Starbucks downstairs! It was hard to say no! Open and spacious lobby with plenty of check-in stations at the registration desk. And if you've haven't purchased your Disneyland tickets yet, there's a counter in the lobby to help you do just that. Another perk is that there's an onsite Enterprise Rent-A-Car desk next to the Disneyland counter so if you wanted to venture beyond the happiest place on earth, you could. Walking into the room is where the real excitement began! We were happy to see that they had some cold beers, water, chips and salsa waiting for us to indulge - yes it was amazing and very fresh! The room radiated with comfort and the perfect sleepy-time low lighting, which was a great change from the bright Paint the Night Parade lights that we had just watched earlier that night. The beds were some of the softest that we've felt in any of the Hilton resorts and the bathroom was absolutely gorgeous with the most exfoliating shower head! The best part was peeling back the black out curtains to reveal an epic theme park view with both Sleeping Beauty's Castle and California Adventure in the distance, illuminating through the dark Anaheim skies. It was truly an experience that can only be appreciated in person. Side Note - Once it was time for us to check out and start heading back to LAX to catch our plane, we found we had a bit too much Pixar Fest merchandise and we didn't want to buy another bag and then pay an additional check bag fee on top of our existing luggage fee! One great feature that the Hilton Anaheim does have is it's FedEx center which allows you to use a computer to print, fax, and handle other business like shipping out packages. We packaged up all of our new merch in a box, taped it up, and shipped it back home across the country for around $30! It's a great deal (prices will always vary on weight, destination and package size) and we think that any over excited tourists who have zero to little self control when it comes to Disney merchandise will appreciate this little blessing. Why struggle with trying to fit everything into a suitcase? Those days are gone! We cannot wait to book a stay once more when we make our way out to California for D23 2019! 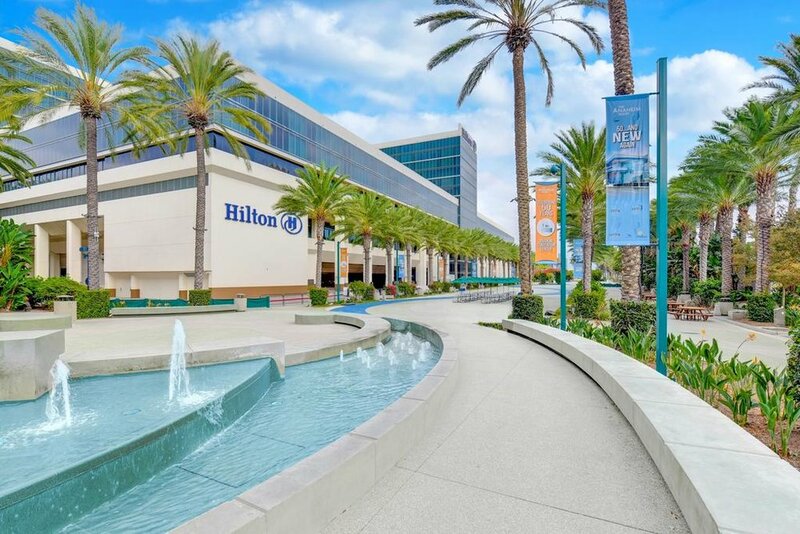 The huge bi-annual D23 convention takes place in the Anaheim Convention Center which is conveniently connected to the Hilton Anaheim. Staying in such a luxurious resort could not be a better move for a crowded and crazy event like D23! If you've been, you know! We've spent WAY too many hours sleeping overnight on the concrete floors waiting in lines for the panels and if you could have a cozy bed just steps away from the expo, how could you say no? And once again.. the merch.. you can walk 2 minutes out the door of the Convention Center and be in your room without lugging it around the show floor. Make's ya think how easy it should be, beacuse it can be. We want to thank the Hilton Anaheim for providing us with such a beautiful room and with such luxurious accommodations! 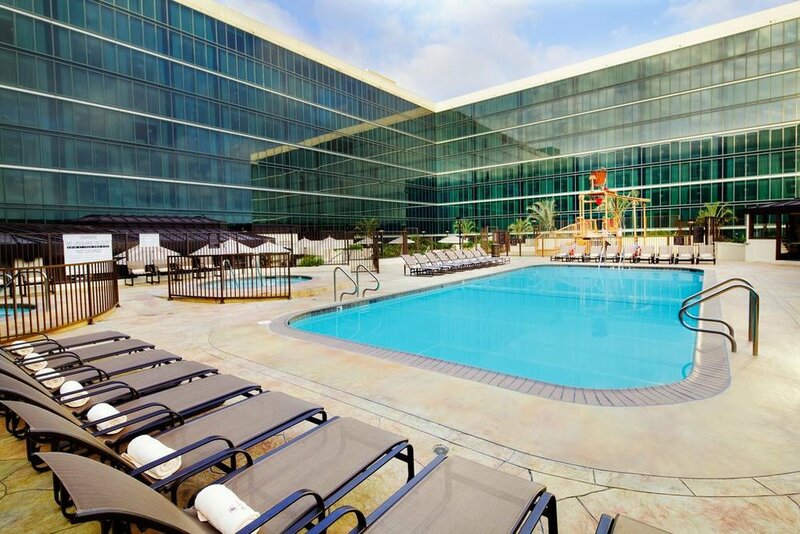 If you're interested in learning more about the Hilton Anaheim or wish to book a room for yourself, click here!